Are you bored of your normal, every day pasta salad? Have you been looking for a healthy but delicious recipe to share with your family? 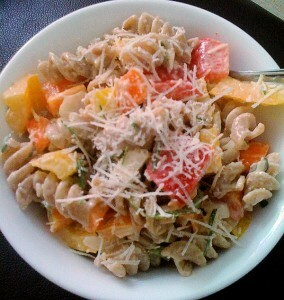 No More Muffintop recently featured this tasty-and-delicious Punch You In The Face Pasta Salad. This recipe includes peppers so there’s a kick to it, but feel free to adjust the quantities to your liking! While you’re chopping everything, boil the pasta. Once it is cooked, throw everything together and enjoy! What do you add to your pasta salad to make it unique? Do you have a special twist on a classic recipe that you’d like to share? Comment below and we might feature it in a future post!